The stupidly-named Kingdom Hearts 2.8: Final Chapter Prologue is a disc of three halves; two games, and a movie. While this might sound extraordinarily generous, the truth is not only that this is a package aimed squarely at existing Kingdom Hearts fans, but also that the vast majority of fans will only really be buying this for what is essentially a lengthy demo. The Kingdom Hearts story has so far been told over fourteen years and almost a dozen formats; if you’re looking to crack into the series now, you have an awful lot of catching up to do. 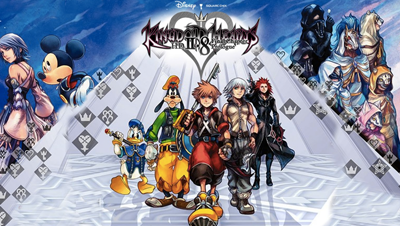 There’s no way I can give a decent summary here, but the skeleton of the premise, for those unaware, is that original Square Enix characters fight alongside and against Disney characters in an effort to stop a threat to multiple worlds. Said worlds, in fact, are often based on a well-known Disney movie or series. It’s just as surreal as it sounds, but it’s nothing if not original. The movie, “Back Cover”, would be more appropriately titled Back Story, providing as it does a little more history to the keyblade weapons (yes, they’re what you’re thinking) that Kingdom Hearts heroes wield, as well as the Foretellers who originally had them. It’s about an hour long, and has the appearance of a good-but-not-amazing cutscene. It’s okay, but offers little new information for those familiar with the lore and will probably have newbies saying “Eh? What?” on a regular basis. One of the games, Dream Drop Distance, is actually a 3DS port. So if you didn’t already have a 3DS and didn’t want to buy one for the sake of one game, you can now play it on the big screen... er, as long as you have a PS4, or are prepared to buy one for the sake of one game. Although it’s been given a decent polish – frame rate is lovely and smooth, and it is indeed all HD as promised – DDD’s portable roots are clear. The textures aren’t exactly what you’d expect from a 2017 PS4 game, and the character models don’t stand up quite so well magnified several times on a TV. It’s a decent length adventure that will see you visit varied environments based on (but not limited to) Tron, Fantasia, and Pinocchio. Effort has also gone into adapting rather than scrapping the elements that previously required a touchscreen, so you still have the minigames (which include what is basically fondling the creatures you create and recruit to level them up). There are significant problems however, not least of which is the unfriendly camera. This remaster was the perfect opportunity to fix it; but things are, if anything, slightly worse. Bad enough on a small screen five years ago, this really isn’t the sort of thing you should be battling with today on your TV. The other leftover problem is the simple fact that combat can get a little tedious, and fights drag on too long even on the lowest difficulty. A great big chunk of people will buy this just for A Fragmentary Passage, the brand new instalment not available outside of this collection. Built from the ground up for the newest generation, it’s pretty enough – and the orchestral soundtrack is gorgeous – but it suffers from a dodgy frame rate now and again. At roughly two and a half hours, it’ll also all be over in less time than it takes to watch a Lord of the Rings film. Credit where it’s due, AFP is no lazy scrap thrown to fans foaming at the mouth for the approaching Kingdom Hearts 3. Did I mention that the soundtrack is wonderful? Because it bloody is. It’s a slightly surreal experience (as Kingdom Hearts games tend to be) but one with a few smart and memorable ideas. It’s worth playing, is it worth the current price however? But some of you are going to go ahead anyway, aren’t you? If you’re a fan that missed Dream Drop Distance the first time around, you might get your money’s worth from this. Everybody else, wait for it to hit the bargain bins.